House, 3 Bedrooms, 2 Baths, (Sleeps 8), Step from the covered deck on the beach! 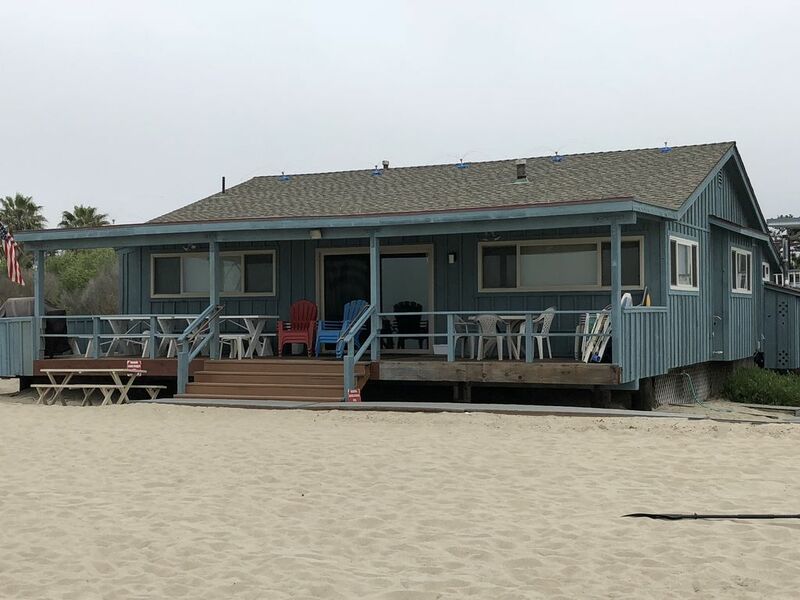 Step onto the sand from the large ocean-facing deck of this 3 bedroom, 2 bath family beachhouse. Located just 10 miles south of Santa Barbara, CA in the popular resort community of Carpinteria, this house sits on the 'World's Safest Beach' sheltered by the beautiful Santa Barbara Channel Islands. Looking out the back, one views the Salt Marsh Reserve with its 230 acres of bird and water wildlife with the backdrop of the Santa Ynez Mountains. The beach offers long walks, warm sand, beautiful sunsets, swimming, sandcastle building, surfing, fishing, and views of the seal rookery and dolphins playing in the surf. The town of Carpinteria, founded in 1863, is noted for its friendliness, small town charm and the agricultural production of avocados, lemons, and flowers. This community is dedicated to preserving the coast at it recently purchased the coastal bluffs just southeast of town which will be kept as they are with a hiking and biking trail along the coast. The downtown area is within an easy walking distance from the beach and offers a variety of antique, clothing, and specialty shops. Carpinteria is fast becoming a mecca for the fine arts representing music, dance, paint, sculpture, and theater. Don't miss Carpinteria's latest addition, the Art Center, with revisions planned thanks to the generous donations of our citizens. Carpinteria's local theater has revised its name to reclaim the original name, The Alcazar. They host concerts, movies, original plays, fundraisers, and talent shows. More recently, restaurants have found a home here, representing cuisine from all corners of the earth. They bring foodies and critics to sample their fine dining. World famous beer and wine have also located to Carpinteria via breweries like Island Brewing Company, wineries, pubs and tasting rooms. Points of interest include the historical museum, the world's largest Torrey Pine tree, the Carpinteria Tar Pits where the Chumash built their canoes and the famous 'cook your own steak' Palms restaurant. World famous surfing at Rincon Point is located only 5 minutes away by car. 5 minutes in the opposite direction on a beautiful sunny afternoon will have you enjoying your refreshments while watching world-class polo ponies at Santa Barbara Polo Club which is open to the public. Kayaks and surfboards can be rented next door and launched with a short walk across the sand to the ocean. Nearby Santa Barbara offers world-class shopping, entertainment, National historical sites, educational forums, and sporting venues like tennis and golf. A wide array of charter boats are available for deep sea fishing, snorkeling, scuba diving, tours, a day trip to the Santa Barbara Channel Islands or a dinner cruise up the coastline. The Santa Barbara Airport is located only 30 minutes away in Santa Barbara, and the Amtrak train, like the Surfliner, makes several stops daily in Carpinteria. Ruth Giacopuzzi, is the proud owner of 'Giacs at the Beach'. For years she has enjoyed sharing this beachhouse with not only her family but also with many other families that have returned year after year for their time in the sun. Some have been coming for over 15 years. This legacy is a tribute to Ruth who enjoys seeing so many families share this beautiful site in this amazing "small town" community called Carpinteria. Dishwashers are those who didn't cook! (2) Two refrigerators are available for daily use. Newly remodeled, new cabinets, stove, microwave countertops. Check out the photos. Two flat screen televisions. One in the family room and the other in bedroom #3.